This booklet offers an account by Chevalier de Bellerive, of his travel from Spain to Bender and his stay in the camp of the King of Sweden, Charles XII, in 1712. Chevalier de Bellerive, captain of a cavalry in Spain, left Spain on the 1st of December 1711. De Bellerive came to Istanbul on the 6th of June 1712. There he met with the French ambassador M. le Comte des Alleurs, the colonel of the Swedish Royal Guard, Stanislas Poniatowski and Charles XII’s interpreter Baptiste Savari who later accompanied him to Bender (p. 7–15). De Bellerive gives diplomatic and very positive descriptions of Charles XII’s looks and habits, and of his relations with France and Sultan Ahmet of the Ottoman Empire. Furthermore, accounts are given about the war between the Muscovites and the Turks with whom Sweden was allied (p. 15–27). Followed by more detailed descriptions of Charles XII and his life in Bender and of his entourage: his secretary of war, M. Feïf, generals and officers, and about 600 soldiers. Charles XII is described as a very active person, always out on horseback or educating the soldiers. He is always busy thinking about the war, his desk is constantly filled with drawings and war plans (p. 28–32). A few pages are dedicated to information about “La bataille de Poltave”, the war between Russia and Sweden in 1709, at the end of which the Swedes were defeated and Charles XII took refuge in the Ottoman Empire (p. 32–39). Chevalier de Bellerive returned home from his trip via Istanbul and he was in France by the month of November 1712. The first edition of this book was printed in 1713, less than one year after Chevalier de Bellerive got back to France. It is supposedly the first book about Charles XII in Bender, published while the Swedish King still resided in Bender. The author dedicated his book to “Son Altesse Royale Madame” (the oldest unmarried daughter of the reigning King of France). Already in 1714 a German translation of the book was published in Frankfurt, Germany. The current edition is from 1872 and it is published with a preface and notes by A. Demarsy (member of la Commision centrale de la Société de Géographie de Paris). There are 310 copies of this edition of 1872, of which the present one is no. 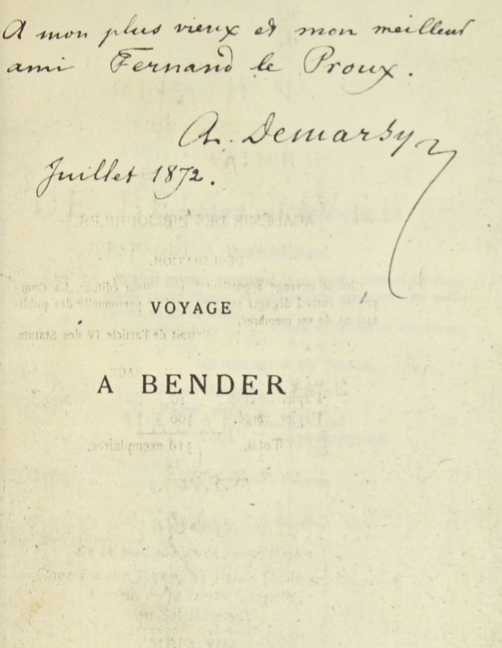 5, signed with a dedication from A. Demarsy to Fernand de Proux, dated July 1872.